The best way to describe the beginning of January is frustrating. I had high hopes to have gotten out on the 1 Jan 16 for at least one summit but heavy rain and high winds put pay to that. So my attention looked towards my next days off and started planning for an activation on Sunday 10 Jan 16. As I have said in previous blogs, I don’t like activating on a weekend due to the higher volume of people on the hills and the constant annoying presence of b****y contesters. However, the XYL had something else planned for the 11th so Sunday it had to be. 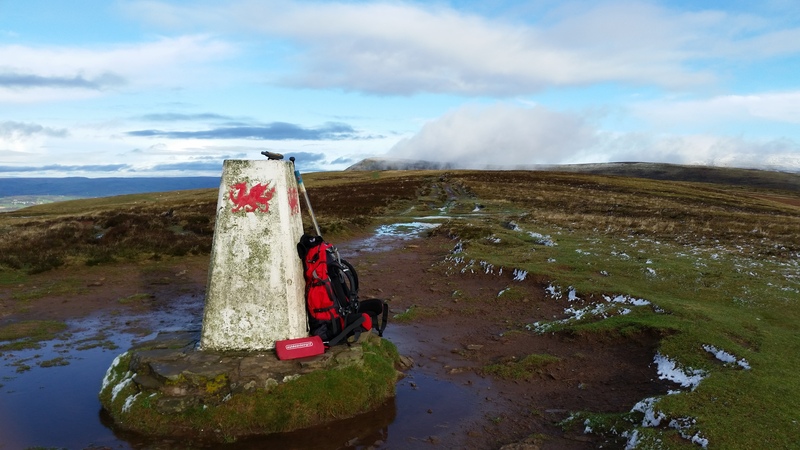 The chosen targets for todays foray were Mynydd Troed and Mynydd Llangorse both in the Black Mountains at the eastern end of the Brecon Beacons. This is an ideal pairing as they share a common parking space (SO 160283) where there is space for about 6 cars, though you need to be there very early on a weekend as Mynydd Llangorse is very popular. So it was that I arrived just as it was getting light at 0750, getting the whole parking area to myself, and by the time I got kitted out and had a coffee it was 0810 as I set off up the track to the summit of Mynydd Troed. 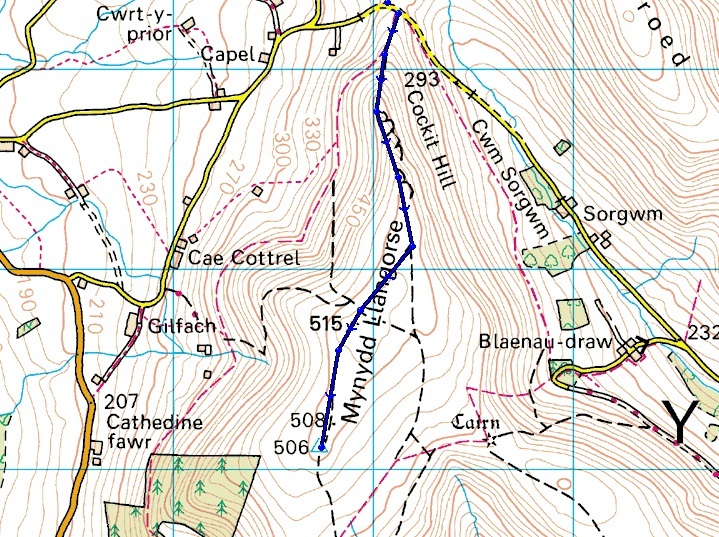 The walk to the top of Troed is fairly short but steep climbing 800 feet in half a mile. The ascent was not helped by the slippery nature of the grass due to the heavy rain fall so progress was slightly slower than anticipated. Further delay was introduced when the clear blue sky disappeared and was replaced by a heavy persistent snow storm requiring the addition of the Gore-Tex. The good layer of snow actually made walking easier as it provided more grip than the wet grass!! 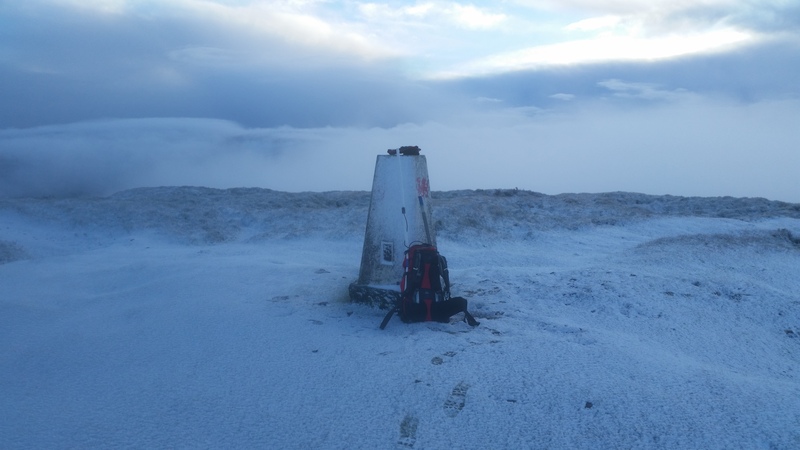 The trig point finally came into sight just as the snow stopped falling. Distance 0.65 miles, ascent 825 feet, time taken 40 minutes. I had originally alerted to start on 145-fm but when I went to connect the coax from the Ruck Sack Special 2m dipole to the VX-8 I found that the BNC connector had fallen off and disappeared. So that brought an end to any 2m QSO’s – not that I could complain, the aerial had lasted 10 years, testament to the quality of the goods from SOTA Beams. Setting up the HF equipment it became evident that the bands were alive and crowded with a plethora of contesters spreading themselves all over the bands without due care and regard for anyone else. I wouldn’t mind if they were making any contacts but 2 stations I listened to were just continually calling CQ Test without any response (sounds a bit like SOTA at times!!). Anyway I found a clearish frequency and fired up on 7-cw relying on RBN for spotting. After about 5 minutes of calling I made my first contact then struggled to get another 4 in the log, the QRM was just too much and my poor unfiltered 817 just couldn’t cope. Moving to 7-ssb it was impossible to find any frequency clear of contesters so having wasted too much time already I packed up and headed down the hill to the car for a quick coffee and banana before setting off up the other side of the coll. 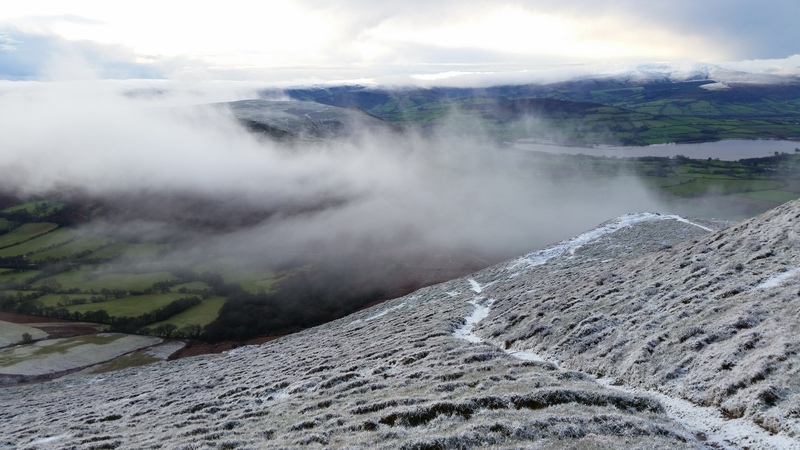 I would imagine that on a clear day Mynydd Llangorse is a beautiful walk, even today with the scattering of snow and the drifting low cloud the views were still quite stunning at times. 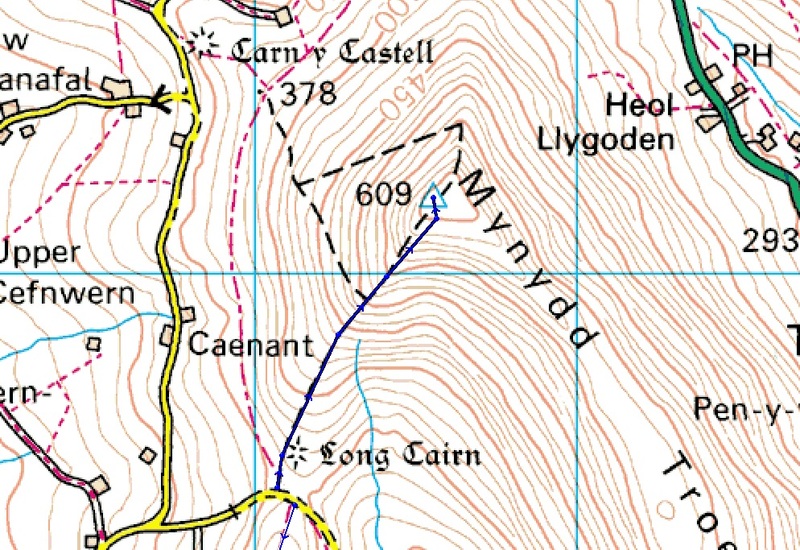 This is a relatively easy hill with a nice steady walk up onto the long ridge, hence its popularity. The top of the initial climb takes you into the vast activation zone, however, being the purist and enjoying the walk I decided to stride out for the trip point at the far end of the ridge. Distance 1.5 miles, ascent 533 feet, time taken 45 minutes. Setting up on the trig itself I managed to find a clear frequency fairly quickly and called on 7-cw. Shortly after starting I got a call from G4ISJ which started a quick run of 8 QSO’s before my activation was abruptly brought to an end by the distant sound of Thunder. Thundery winter showers had been forecast so not wishing to get stuck out in the open I pulled the plug at the first sign of pending doom and headed back along the ridge. By the time I got back to the top of the descent the snow had started falling again so I was glad to get back to the warmth of the car for the last of my coffee and the prospects of a 2:45 hour drive home. 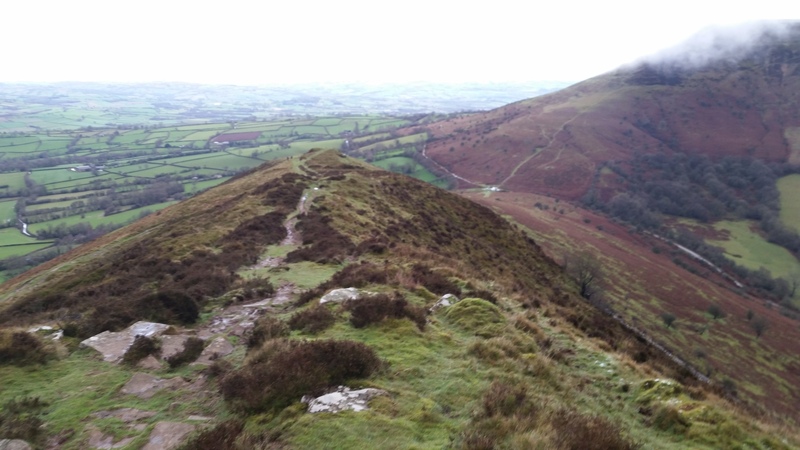 For my first activations of 2016 I had a really great time in the Black Mountains. The scenery is, as always, beautiful and the added bonus of the snow made for a great walk. Unfortunately the persistent annoyance of contesters spoilt the radio for me but I still managed to qualify both summits. Having to leave early because of the risk of thunder and lightening is something we have to accept but safety must always come first, the hills will still be there next week. Whilst my 2m ruck sack dipole was getting on and really due for replacement it was a shame to consign it to the bin. It was not just the BNC connector that had fallen off, it was held together with more gaffer tape than a construction site! so was well due to be replaced. I have also decided that I need to add 30m to linked dipole for the rare occasions I have to activate at the weekend and need to compete with noise polluters.